Tony came to us with a PDF of a compilation of his comic strip, which had already been created as a print book. However, there was a small twist in that the title of the book was different in the UK and only in the UK. 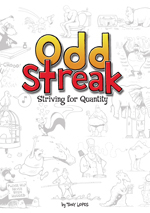 We took the PDF as well as the amendments that needed to be made in order to change the title from Insanity Streak to Odd Streak and converted them both separately. Throughout the process Tony needed a couple of cartoons replaced with others that he supplied. We turned this PDF in to 2 separate fixed layout ePub and mobi KF8 files that we then aggregated on the major vendors. 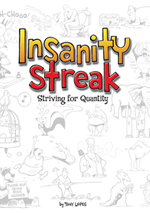 Peer inside the wandering mind of award winning cartoonist Tony Lopes to witness his hilariously funny comic, Insanity Streak. Tony Lopes' legion of fans (well, perhaps pluralising the word "fans" is taking some liberties) will love this first, truly comprehensive collection of Insanity Streak. If up until now you haven't seen Insanity Streak, then you're not alone - over a billion people are yet to -but once you do, you're sure to be addicted to this laugh-out-loud comedy chaos.